Rub salmon with salt and chilli flakes, fry until golden brown on both sides. Fry tomatoes in the same pan for 1 minute. Boil water, add 1 tbsp salt and 1 tbsp oil, blanch spinach for 2 minutes, and drain. Mix yogurt, cream mustard , pepper and chopped mint leaves. 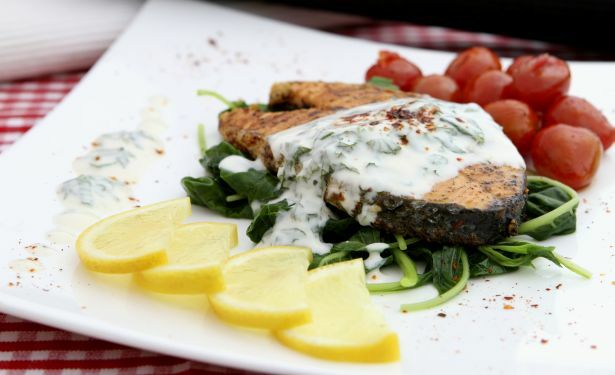 Serve salmon hot with spinach, yogurt and cherry tomatoes. Squeeze a little lemon to add flavour. Note: Add one or two pinch of chilli flakes to the sauce for a spicy sauce. Don´t overcook the salmon. It should be golden brown on the outside and moist inside. It will take 3 minutes on each side to brown on high fire.